We feel proud to introduce ourselves as the leading supplier of premium class range of DSL-850 Bag To Bag Printing Machine 4 Color. Offered machine is extensively demanded owing to its simple operation and smooth functionality. The provided machine is manufactured with high precision by our skilful professionals who hold years of experience in the domain using supreme grade components and ultra-modern techniques in accordance with defined industry standards. 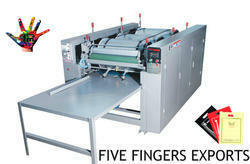 This machine is used in bag making industry for printing. We are instrumental in providing our clients a comprehensive range of Hi-Tech FFN- Flexo Roll To Roll Printing Machine 4 Color. Using quality assured components and contemporary technology, this machine is precisely manufactured under the direction of deft professionals at our sound production unit. Our quality examiners thoroughly test this machine on various measures of quality for ensuring its long working life. We provide this machine at a rock bottom price within promised time span. Equipped with steel chrome anilox to transmit the ink. Looking for Non Woven Bag Printing Machine ?